FWIW, the Negril in Gaithersburg has been sold and is now called Antonio's. It's still selling Jamaican food but has added Latin American food to the menu. All this has been reported on in some other thread. My coworkers and I hit this place for lunch at least once every other week. It's sad to report that after maintaining the previous owner's high standards for several months after the change in ownership, Antonio's has officially gone downhill. The last two meals there have been extremely unremarkable (I won't say "bland" but in comparison to previous efforts, it certainly seems that way). The spicy scotch bonnet hot sauce has been replaced by the generic red hot sauce that you find at the Chinese fast food outlets in the mega-mall. The jerk chicken no longer has any kick and the chicken curry tastes like they're using generic curry powder out of a can. Ugh. 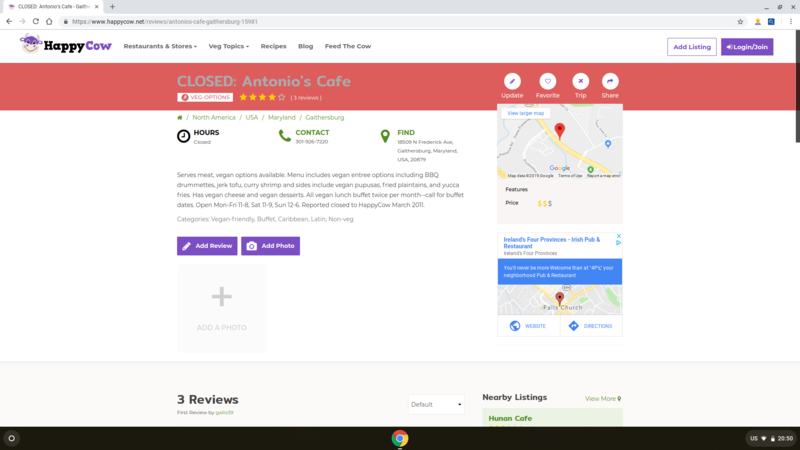 I went deep into the back pages, and found a restaurant I'd not tried (though I went there once when it was Negril) - Antonio's was reported closed in Mar, 2011.